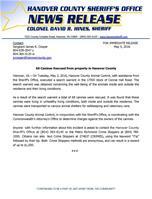 Hanover, VA – On Tuesday, May 3, 2016, Hanover County Animal Control, with assistance from the Sheriff’s Office, executed a search warrant in the 17000 block of Connie Hall Road. The search warrant was obtained concerning the well-being of the animals inside and outside the residence and their living conditions. As a result of the search warrant a total of 68 canines were rescued. It was found that these canines were living in unhealthy living conditions, both inside and outside the residence. The canines were transported to various animal shelters for safekeeping and veterinary care. Hanover County Animal Control, in conjunction with the Sheriff’s Office, is coordinating with the Commonwealth’s Attorney’s Office to determine charges against the owners of the canines.